You might have often heard the terms like ‘Quality of Service’ (QoS) during discussions about ‘VoIP’. Quality has been the key driving force behind the development of modern telephony systems like VoIP. Let us try to understand why QoS is so important for VOIP. Let’s start with VOIP. Voice over Internet Protocol or VoIP allows you to take voice calls and data over your IP network. Thanks to the increase of bandwidth of the internet over the last few years, it is now possible to take calls over the internet. 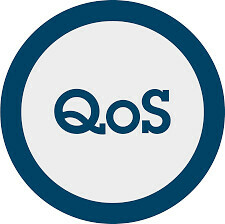 QoS is an indicator that shows how the telephony system is living up to the expectation of the user. Is it performing as expected without affecting communication? In VoIP, it is important that QoS is maintained as for replacing PSTN or public switched telephone network the quality of voice transmission should be same as PSTN. That means there should be a constant transmission of high-quality voice over the IP network. An example will make these things easier to understand. Do you feel any difference in driving a freeway at 2 AM and at 9 AM in the morning? You must have. At 2 AM, the freeway will have fewer cars and that will let you speed up your car and get to your destination without any delay. However, the story would not be same at 9 AM when the traffic is much more as it is peak hour of the commute. You will be sharing the freeway with many other cars and thus, the movement will be slow. In the case of VoIP network too, when there are fewer users the bandwidth is shared among few and they can get maximum speed. That gives them high-quality voice transmission without a drop in calls. However, when the number of users increases the same bandwidth is shared between all of them and congestion arises. Here comes the need for Quality of service that ensures that you can complete your calls without any fail. To get out of this, a QoS enable router is of great help. How QoS helps in VoIP? For getting maximum utility from VoIP network, it is essential that it guarantees high-quality voice transmissions. This is possible when the voice packets are given priority over other any other kind of traffic. VoIP requires certain bandwidth, jitter requirements, and latency so that the user receives a high voice quality. This standard of voice quality is maintained by QoS. It ensures that the quality of voice is maintained by giving preferential treatment as required. Another example will further clarify the above. Consider the situation how you board an airplane. It is the first class passengers boarding the plane first, followed by business class and, at last, economy class passengers get the opportunity. A first class passenger can board the plane even when an economy class passenger is boarding. They are given special treatment. Now, if there was no prioritization then all the passengers would have tried to rush to the gate bypassing the queue. Commotion and confusion will be the result of such a scenario. Thus, prioritization is important in airlines. In a similar manner prioritization holds true for IP networks as well. Yes, without special treatment no one can complete their work through the network as it will be congested during rush hours. Here comes importance of Quality of Service that ensures that there is sufficient bandwidth for managing the Voice calls. If there is fluctuation in the voice quality then QoS capable routers and switches fix the problem. The managed switches will send information to the network that highly important voice data has to be transferred first. If this is supported by the network then it will give priority to the voice traffic over the data traffic and you can get high-quality voice calls without any problem.